and advanced technology laser cutting machines. TCI Cutting devotes important resources to such training. Training the client’s workforce is a fundamental requisite in order to be able to gain maximum benefit from using high pressure water jet cutting machines and advanced technology laser cutting machines. High technical competence, excellent communication skills including in foreign languages and a passion for the difficult task of passing on knowledge: these are the most valued qualities we seek when selecting a trainer. The technicians who specialise in such training work in close contact with our Department of Research and Development in order to keep totally up-to-date with the latest water jet or laser cutting systems and also to transfer back to the product itself the experience they have obtained during their work in the field. By means of training courses taught in the classroom as well as directly in the workplace alongside the water jet and laser cutting machines, the TCI Cutting instructors accompany and assist the client’s technicians on a guided tour which allows them, firstly, to get to know the basic working principles of the water jet or laser cutting machinery and then to make the best use of them. The client company may adapt the training course programmes to suit the specific requirements of their production style. 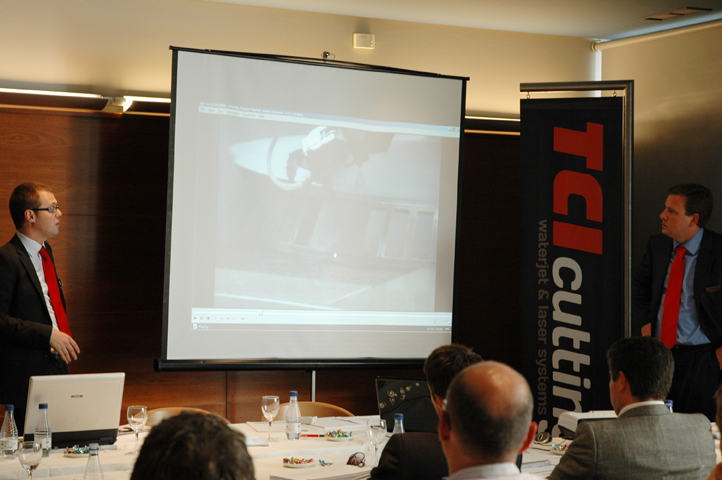 Furthermore, in accordance with the preference of the customer, the training courses may take place either at their workplace or on the premises of TCI Cutting. This last option enables the client’s personnel to receive training while the cutting machine is actually being installed in their workplace. The machine can be put into production with practically immediate effect. For those clients who wish to further the training of their technicians to cover advanced maintenance techniques and breakdown diagnosis, TCI Cutting offers the possibility of refresher courses or more advanced training.